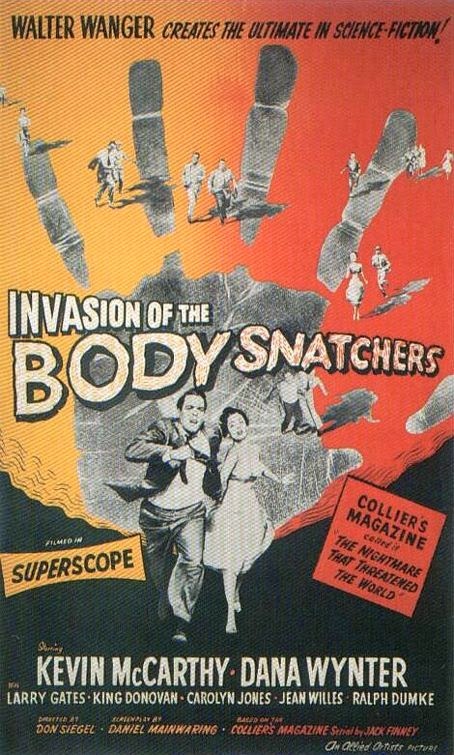 Tag line: "The original nightmare that threatened the world"
Whether or not you believe it’s an allegory for McCarthy-era politics (a hot topic when it was released in 1956), one thing is certain: Don Siegel’s Invasion of the Body Snatchers is a masterpiece of paranoia, with its lead character left to wonder if there’s anyone in the world he can fully trust. Following a brief vacation, Dr. Miles Bennell (Kevin McCarthy) returns home to find a very different town than the one he left, with people from all over complaining that their loved ones have somehow changed, and are no longer the person they once were. At first perplexed by this strange occurrence, Miles soon realizes he’s dealing with more than a simple case of mass hysteria. Aided by his former girlfriend Becky (Dana Wynter) as well as his good friends Jack and Theodora “Teddy” Belicec (King Donovan and Carolyn Jones), Miles uncovers evidence that the citizens of his community are being replaced by duplicates, the first step in what very well could be an invasion from outer space. The pods themselves, in which the duiplicates are "grown", are effectively creepy, but its the shadows and sharp angles director Don Siegel employs throughout the film that conjures up feelings of paranoia and confusion, as if the entire world were closing in on his main characters. Shortly after he makes his startling discovery, Miles tries to call the federal authorities, only to be told by the operator that all lines are busy. Under normal circumstances, a call failing to go through wouldn’t so much as raise an eyebrow. In this particular case, however, it intensifies Miles’ distrust of those around him, casting the light of suspicion on the operator herself. Maybe the lines really were busy. Or maybe… just maybe… they weren’t. While the 1978 remake of Invasion of the Body Snatchers is a more effective horror film (in that movie, the “duplicates” don’t always worry about blending in), the ‘56 version is every bit as thrilling. Exploring the themes of individual identity and mass conformity while, at the same time, playing on our basic fear of being alone, Invasion of the Body Snatchers Is a motion picture that will always be relevant. I recently watched this for the first time and I was very impressed by how well it worked and even more impressed by how relevant it still is. What reached me the most was the idea of a loved one not loving you anymore. Not long ago I went through a very painful breakup, so I instantly imagined my ex-girlfriend having been bodysnatched. For what other reason could she have changed from one day to the next? I'm kidding of course... but what if? What if?